4 Carts down 2 to go. Today I went to Lunch Box Wizard. Formerly located at 52nd and Foster, this cart has nested a new home at 20th and Everett with the rest of the Green Castle food carts. 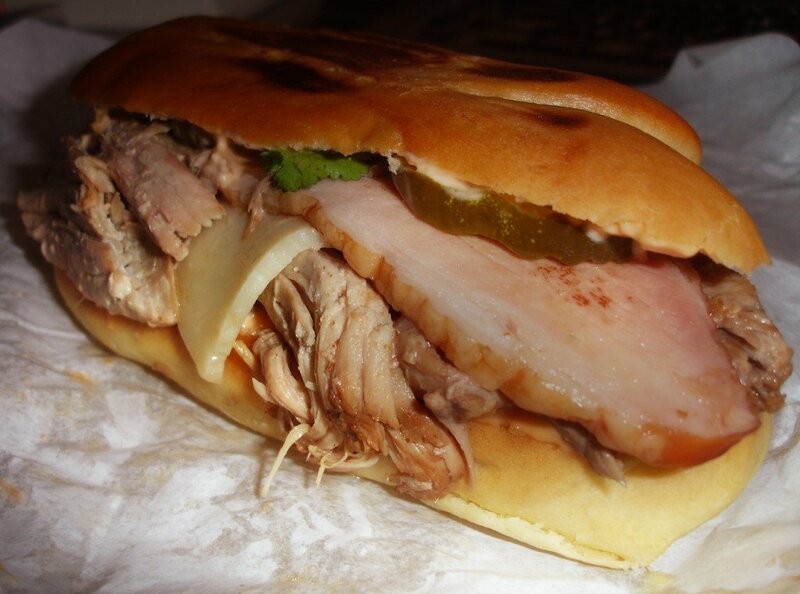 On Urbanspoon.com I saw the signature sandwich was a Cuban sandwich with the caption “dry meat”. I wasn’t looking forward to a dry meat sandwich, but for the sake of trying a signature dish, I felt it was appropriate. This thing was AMAZING. When the girl at the counter handed it to me, I was drooling looking at the menu which included bacon wrapped dates and ice cream bites. That ham is about a 1/4″ thick cut, the pork was nice and sweet, the cheese was melty but not too melty. The sweet pickle placed off of the taste of the buttery bun just right and the cilantro was a happy little punctuation to the entire sandwich…which weighed in at about 4 pounds*. This sandwich was $6.50 and well worth it! I give it 9/10 finger-lickin’s and will definitely be back for seconds. Before I ate the sandwich and as I was walking out of the food pod, I wanted to make sure I had enough to eat, so I stopped to get a fix of Cackalackin’s Hot Chicken Shack’s potato salad. I reviewed that here so I won’t go into the exquisite details of it now. Now if I can get some solid information on what kind of hours the “Weenies on the Water” cart holds, I’ll be reviewing that next. Thanks for dropping by! You have to stop this. I miss the PDX carts bad enough as it is. We do have Skillet, and a few great taco trucks, but they are so far apart…I miss the numerous Cart Meccas in Portland so much. Though, not as much as going there with you! Thanks Don! Yeah man, they are like a delicious itchy rash that is spreading all over PDX and I am, in no way, desiring talc. Thanks for the kind words on my sugnature sandwich. I bake my Cuban bread on site. Now everyone should beware, the Yakusa is moving in! Baguette laden Wasabe Aioli with Chicken Fingers laid carefully atop the Wasabe Aioli, lightly bathe with Tonkatsu Sauce, blanketed with a light bed of seaweed salad, then finished with sliced pickled Ginger! Thanks!!! Yeah! It was pretty amazing. Have a great week!